Spending time up here in the Northwest has been powerful. I live at the base of an extinct volcanic park filled with trees that tower over everything like something from one of the Hobbit movies or Lord of the Rings. 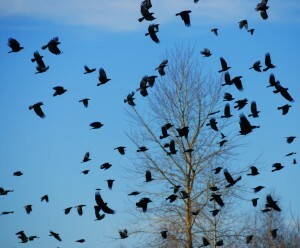 The crows here appear in large flocks and circle and hover all around my home and the park. This morning, their call and large numbers was unusual and I went outside to stand in the middle of all of them. They swarmed the house and filled all the trees surrounding the house. It was gorgeous. They flew past me and around me with a grace and beauty that sent chills through my body. Their presence was the message of upcoming change and deep transition. I could literally hear the sound of their wings and see the deep look in their eyes as they flew past me within only a few inches from me. This transition time is not always an easy one. Our minds and hearts may clash and our desires and goals battle one another. Practicality bumps up against our dreams and we continue to use all our strength to stay as centered as we can. If you find yourself needing guidance during this transition time – I am here to support you. I can provide you with steps to reconnect with your personal power and know what the next step to take to walk your own personal path of transition and change. You don’t have to walk through this time of change on your own.